The UK economy is in such a parlous state that the Bank of England is threatening to raise interest rates even though last year’s GDP growth rate was a feeble 1.8% and real wages continue to decline. This is a striking effect of the dearth of investment since the Great Recession. The Bank’s Governor Mark Carney is concerned about capacity constraints in the economy leading to inflation. This lack of capacity, the weak growth in the means of production, arises because there has been a woeful lack of productive investment from before the recession began in 2008. 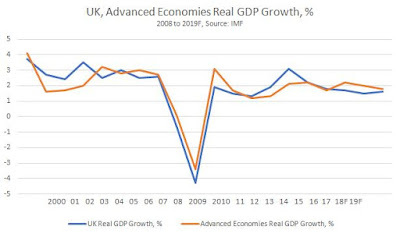 The UK economy is actually receiving a lift from the upturn in the world economy, particularly in Europe, but its relative position is declining. In effect, as the world economy is expected to see its best growth rate since 2010, the UK economy is expected to see its worst growth rate since that time. In the three years from 2017 to 2019, the latest projections from the IMF are that the world economy will accelerate to an average of just over 3.8% real GDP growth. At the same time the UK economy will decelerate to less than half that growth rate, to just under 1.6%. By contrast, the advanced economies as a whole are expected to accelerate to just under 2.3%. The IMF expects that the main driver of world growth will come from what it describes as ‘Emerging market and developing economies’ at just under 4.9% growth, led by India and China. The IMF has no crystal ball, and frequently makes incorrect forecasts. But the divergence in growth expectations for the UK economy compared with most of the rest of the world is striking. The UK is also one of only two economies it highlights where the IMF has downgraded its growth expectations. The UK economy is already in poor shape. The advanced economies have been crawling along in growth terms since the crisis began. Using IMF projections for the next two years, these advanced economies will have grown cumulatively by just 17.1% over 12 years. But the UK economy will have grown even more slowly, by just 14.3%. 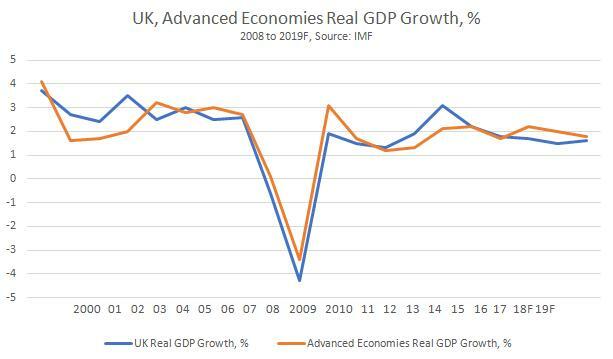 The relative growth rates for the UK and for the advanced economies as a whole are shown in Chart 1 below. Even the UK’s sub-standard growth rate does not provide an accurate picture of the bleak outlook for living standards. 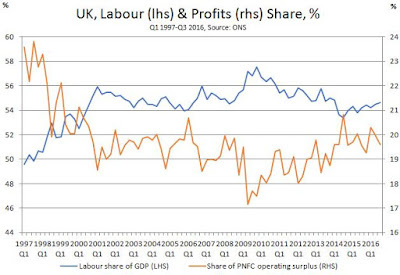 In addition to the sharp deterioration in public services and social welfare provisions, the labour share of national income has fallen sharply since the imposition of austerity in 2010, as shown in Chart 2 below. Austerity can be seen as an attempt to drive up the profit share from its low-point of 17.1% in mid-2009, just after the crisis began. The prolonged effort has only been partially successful, as the profit share has increased from its low-point, yet it remains far below its pre-crisis highs at the turn of this century. But the labour share (in an economy that is barely crawling along) has not recovered from its end-2009 peak. Mathematically, the labour share is an independent variable, not determined by the growth rate of GDP and instead determined by the struggle between workers and bosses over wages, pensions and other entitlements. In reality, the struggle for higher or even constant wages is exceptionally difficult when the economy is not expanding more rapidly. 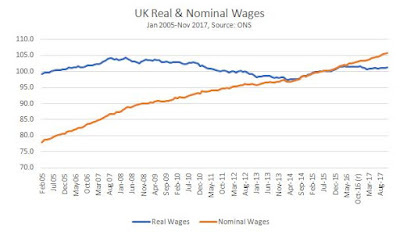 Real wages are now 3% below their peak level in March 2008, as shown in Chart 3. Nominal wages rose 19.5% over the same period, but the two currency devaluations of the pound, one arising from the recession and the other following the Brexit vote, have more than eroded that rise in cash terms via inflation. Higher wages, just like improved public services and social provisions are much easier to achieve with higher economic growth. But the widespread expectation is that UK growth will be slowing over the next period. This has negative consequences for living standards in the broadest sense, including real pay, social welfare and public services. The consequence for government finances will also be worse, as tax revenue growth will be curbed and outlays related to poverty and under-employment will be higher. Therefore, in order to address the crisis in living standards and wages, and to tackle the glaring problems in areas such as housing, the NHS, social security, public sector pay and so on, radical measures will be required at a time when government finances are once more under pressure. Even if Carney is proved wrong in his forecasts of the Bank’s own actions, his pronouncements show that the UK economy could become locked in low growth over the very long-term, with every modest upturn met with higher interest rates to choke off the threat of inflation. To be clear, in mainstream economic policy making all types of inflation are allowed, house prices, stocks and bonds, even Bitcoin. But wage inflation is not permissible and it is this ‘threat’ the Bank of England is poised to prevent. Since the recession a number of measures have been adopted which have been designed to boost the economy by raising demand (‘Help to Buy’) or by creating money (‘Quantitative Easing’). By themselves, they are unable to sustainably raise the growth rate of an economy which remains in crisis because of weak investment. The UK economy is experiencing a productivity crisis, which is not a ‘puzzle’ or ‘mystery’ as is widely claimed, but is instead a function of its low rate of investment. The advanced industrialised countries as a whole are also experiencing a productivity crisis, and the UK is simply among the worst because its level of investment is among the worst. Productivity matters, because without increasing productivity any rise in living standards is dependent on working harder, or longer hours, or labour trying to claim a greater share of national income from capital. “The contributions of capital and labor inputs have emerged as the predominant sources of economic growth in both advanced and emerging economies. Economic growth depends primarily on investments in human and non-human capital, including investments in both tangible and intangible assets”. Jorgenson’s research shows that it is the amount of capital and the amount of labour, as well as their quality, that are the decisive factors in growth. This statistical analysis refutes all efforts to portray growth as ‘demand-led’, or ‘aggregate demand-led’, or a function of innovation, or entrepreneurial activity, or other myths. Jorgenson also analyses the historical impact of changes in these inputs for total growth in a variety of economies, including lesser economies like the UK. Using these analytical tools, it is possible to outline a projection of growth for the UK economy based on increasing those inputs, capital and labour, in line with the Labour Party’s intention to end austerity and reverse it. In a follow-up piece, that outline will be presented. On Friday 2 February sharp turmoil, which had been building for some time, shook US financial markets. The driving force was the continuing sharp rise in US Treasury Bond yields, that it the interest rate on US Treasuries, which has risen from 1.86% when Trump was elected to 2.84%. US Treasury rates set the floor for all long term US interest rates and are far more important for US economic trends than the shifts in Federal Reserve interest rates. Simultaneously US jobs data was released showing that wages in January had risen by 2.9% compared to a year earlier - seen as an indicator of inflationary pressure in the US. Meanwhile commodity prices, as measured by the S&P GSCI index had risen by 10.6% compared to a year earlier - adding to inflationary pressures in the US. This helped precipitate a 2.1% fall on 2 February on the S&P500 - the most severe daily decline since Trump was elected. In summary the US economy was showing clear signs of rising interest rates and rising inflation - producing the market turmoil. Inflation shows that supply of goods and services, including labour, is smaller than the demand for it. In summary, despite low growth, the US is showing signs of capacity constraints. The new release of US and EU GDP data for the whole of 2017 allows a factual examination of the latest state of the US economy and constitutes a baseline for assessing the future impact of the Trump tax cuts. This new data confirms the following fundamental features of US economic performance. In 2017, for the second year in a row, the US was the slowest growing of the major economic centres – behind not only China but also the EU. There was no sign of an improvement in the fundamental economic structure of the US economy that would permit significantly accelerated growth in the medium/long-term. Therefore, the perspective is that the US will undergo a cyclical upturn in 2018 before encountering capacity constraints that will again slow its economy in 2019-2020 – the symptoms of these capacity constrains are likely to be increasing interest rates and rising inflation. This situation of the US economy has significant implications for US-China relations. In particular, as the US is unable to speed up its medium/long term growth, those forces in the US seeking to engage in ‘zero-sum game’ competition with China can only achieve their goal of improving the position of the US relative to China by trying to slow China’s economy. These implications will be considered in the conclusion of the article. However, first, using the approach of ‘seek truth from facts’ the latest data on the US economy will be examined. This data shows that the claim in sections of the Chinese media that in the last two years the US was undergoing ‘dynamic growth’ was entirely false, the opposite of the truth. Bluntly it was in the category of ‘fake news’. In addition to the data for the whole of 2017, in the year to the 4th quarter of 2017 the US was still the slowest growing major economic centre – US growth was 2.5%, EU growth 2.6%, and China’s growth 6.8%. Although the facts of US poor economic performance in 2017 and 2016 are therefore clear this clearly poses a question. To what degree will the US improve this performance? This in turn requires examining both the position of the US in the present business cycle and the medium/long term determinants of the US economic performance. In order to separate purely cyclical short-term movements from medium/long term fundamental trends in the US it should be noted that the medium/long term growth of the US economy is one of the world’s most predictable. Analysing the latest data, which go up to the 4th quarter of 2017, Table 1 shows that the three-year moving average of US annual GDP growth is 2.1%, the five-year moving average is 2.3%, the seven-year average is 2.1%, and the 20 year average is 2.2%. Only the 10-year moving average shows a significantly lower average - due to the great impact of the post-2007 ‘Great Recession’. Given that medium and long-term trends closely coincide the US fundamental medium/long term growth rate may therefore be taken as slightly above 2%. This consistent US medium/long term growth rate also makes it relatively easy to assess the short-term position of the US in the current business cycle. The key features of the latest data, for US economic performance in the final quarter of 2017, are given in Figure 2. This shows that US year on year economic growth in the last quarter of 2017 was 2.5%. This represents an upturn from the very depressed US growth during 2016 – which reached a low point of 1.2% growth in the 2nd quarter of 2016. To accurately analyse this data, it should be noted that confusion is sometimes created in the media by the fact that the US and China present their quarterly GDP data in different ways. China emphasises the comparison of a quarter with the same period in the previous year. The US highlights the growth from one quarter to the next and annualises this rate. But the US method has the disadvantage that because quarters have different economic characteristics (due to the different number of working days due to holidays, weather effects etc) this method relies on the seasonal adjustment being accurate. But it is well known that the US seasonal adjustment is not accurate – it habitually produces low growth figures for the first quarter and correspondingly high figures in other quarters. It is therefore strongly preferable to use China’s method which, because it compares the same quarters in successive years, does not require any seasonal adjustment and therefore gives true year on year growth figures. All data in this article is therefore for this actual year on year growth. In addition to showing 2.5% year on year growth for the latest quarter, Figure 2 shows that US annual average GDP growth was below its long-term average of 2.2% for six quarters from the 4th quarter of 2015 to the 1st quarter of 2017. Therefore, merely to maintain the US average growth rate of 2.2%, US growth would be expected to be above its 2.2% average growth rate for a significant period after the beginning of 2017. Figure 2 shows this is occurring, with US growth in the third quarter of 2017 being 2.3% and in the last quarter of 2017 reaching 2.5%. Therefore, the acceleration of US growth in the last quarter of 2017 was a normal business cycle development and did not reflect an acceleration in US medium/long- term growth. It should be noted that Cohn’s claim is that three percent growth can be achieved over a business cycle – which would indeed be a substantial increase in US medium/long term growth. It is not at all the same as the US achieving three percent growth in a particular quarter or quarters – which has occurred previously and is entirely compatible with the maintenance of the current US medium/long term growth rate of just above 2.2%. There is, of course, even less evidence that the US economy will achieve 6% growth as claimed by President Trump in his December press conference with Japanese prime minister Abe. In order to asses the realistic growth rate for the US it is now necessary to analyse the fundamental determinants of US medium/long-term growth. The most fundamental trend in US long term growth is the progressive slowing of the US economy which has been taking place for over 50 years. Figure 3 shows that, taking a 20-year moving average, to remove all short-term effects of business cycles, the US economy has progressively decelerated from 4.4% annual growth in 1969, to 4.1% in 1978, to 3.5% in 2002, to 2.2% in the 4th quarter of 2017. The fact that the US economy has been slowing for over 50 years shows that this process is determined by extremely powerful and long-term forces which will, therefore, be extremely difficult to reverse. The nature of these trends is analysed below – the latest US data, however, clearly shows no acceleration in long-term US growth which remains at 2.2%. Turning from long-term to US medium-term growth, this necessarily shows greater fluctuations than US long term growth – as medium term growth rate is affected by business cycles. It is therefore useful, in analysing such cyclical fluctuations, to consider not only the average trend but also to make a comparison of successive peaks and troughs of business cycles. To illustrate these a five-year moving average for US growth is shown in Figure 4 and a three-year average is shown in Figure 5. • Taking a five-year average, and considering the maximum growth rate in business cycles, the US economy slowed from 5.5% in 1968, to 5.0% in 1987, to 4.5% in 2000, to 3.0% in 2006, to 2.3% in the 4th quarter of 2017. • Taking a three-year average, the US economy slowed from 5.9% in 1985, to 4.7% in 1999, to 3.7% in 2006, to 2.1% in the 4th quarter of 2017. Therefore, the long-term tendency of the US economy to slow down is again clear. The trend of the peak growth rates in US business cycles falling over time is precisely in line with the long-term slowing of the US economy. Having shown the factual trends in US economic growth it is then necessary analyse what produces them. My article 'Trump's Tax Cut - Short Term Gain, Long Term Pain for the US Economy' analysed in detail that statistically the strongest factor determining US medium/long term growth is US net fixed investment (i.e. US gross fixed capital formation minus capital depreciation). Table 2 updates the data regarding this given in the earlier article to now include 2017. As may be seen, over the short-term there is no strong correlation between US GDP growth and the percentage of net fixed investment in US GDP – the R squared correlation for 1 year is only 0.21. Indeed, as 'Trump's Tax Cut - Short Term Gain, Long Term Pain for the US Economy' showed in detail, there is no structural factor in the US economy which is strongly correlated with US growth in the purely short term. That is, put in other terms, numerous factors (position of the economy in the business cycle, trade, situation of the global economy, weather etc) determine short term US growth. However, as medium and long-term periods are considered, the correlation of US GDP growth with the percentage of net fixed investment in US GDP becomes stronger and stronger. Already over a five-year period the level of net fixed investment in US GDP explains the majority of US GDP growth, and over an eight-year period the R squared correlation is 0.71 – extremely strong. It is unnecessary for present purposes to establish the direction of causality in this relation. The extremely strong correlation between US GDP growth and the percentage of net fixed investment in US GDP simply means that over the medium/long term it is not possible for the US economy to acclerate without the percentage of US net fixed investment in GDP increasing. This equally means that analysing the percentage of US net fixed investment in US GDP allows the potential for the US to accelerate its medium/long term growth to be determined. This also means that to assess Trump’s possibility to increase US medium/long term growth it is necessary to analyse trends in US fixed investment. Turning to analysis of these factual trends, Figure 6 illustrates the percentage of net fixed investment in US GDP – showing the extremely sharp fall in this which has occurred. This fall corresponds to the long-term slowdown in US growth already analysed. In the 4th quarter of 2017 US net fixed investment was 4.2% of US GDP. It is therefore clear that while there has been some recovery of US net fixed investment since the extreme depth of the international financial crisis, US net fixed capital formation remains not only far below post war peak rates but even well below pre-international financial crisis levels. Due to this very strong medium/long term correlation between US net fixed investment and US GDP growth US economic growth cannot accelerate over the medium/long term without an increase if the percentage of US net fixed investment in GDP. Furthermore, it is clear that no such increase in the percentage of US fixed investment in GDP has taken place. Therefore, there is at present no basis for an acceleration in US medium/long term GDP growth. Nothing has yet occurred which would indicate or permit an acceleration in medium/long term US growth from its present level of slightly above two percent. The US is undergoing a normal cyclical recovery after its extremely poor performance of only 1.5% growth in 2016. Furthermore, in order to maintain the US long-term average growth rate, and counterbalance an extremely poor performance in 2016 and only slightly above average growth of 2.3% in 2017 as a whole, US GDP growth in 2018 would be expected to be above its long-term average – the effect of the Trump tax cut would be expected to sustain this short term increase. This trend however would not, unless the level of growth reached was extremely high, represent a break with the medium/long term slow growth of the US economy. It is of course important to follow and check these trends factually given the importance of the US for the global economy and for China. Given the determinants of US economic performance over the medium/long term it follows that, in addition to factually registering US growth, it is necessary to regularly analyse the percentage of net fixed investment in US GDP in order to see if any new conditions for an acceleration of US medium-long term growth is occurring – so far it has not. It should also be noted that the Trump tax cut, because it is not matched by government spending reductions, will sharply increase the US budget deficit and therefore, other things remaining equal, it will reduce US domestic savings, and therefore reduce the domestic US capacity to finance investment. In 2018 continued cyclical upturn in the US economy. Due to the factors that would permit an upturn in US medium/long term growth not being present this cyclical upturn in 2018 will not turn into a much stronger upturn in 2019-2020 but on the contrary medium/long term factors slowing US growth may reduce growth from its likely 2018 level. As the problem in the US economy is lack of net fixed investment, that is in expansion of the US capital stock, the form of these factors slowing the US economy after its 2018 recovery are likely to be symptoms of capacity constraints and overheating – i.e. increases in US interest rates and in inflation. This upturn in US interest rates is already clear, with the yield (interest rate) on US 10-year Treasury Bonds rising significantly from 1.86% when Trump was elected to reach 2.84% on 2 February. Finally, while the focus of this article is economic, it is clear certain geopolitical conclusions flow from these factual trends in the US economy. The inability of the US, with its present level of net fixed investment, to increase its medium/long term economic growth means that those in the US who advocate a ‘zero-sum game’ approach to US-China relations (‘neo-cons’ and ‘economic nationalists’) cannot achieve their goal of strengthening the position of the US compared to China by fundamentally accelerating the US economy. Their only practical policy option, therefore, is to attempt to slow China’s economy. This may possibly not be clear during 2018, when the US is undergoing a normal cyclical upturn, but it will become clear later as medium/long term US growth fails to accelerate. The reduction in US domestic saving caused by the current tax cut means that US sources of financing fixed investment, other things remaining equal, will be reduced. This will increase pressures on the US to attempt to maintain its level of fixed investment through increased foreign borrowing – as in principle US fixed investment can be financed from foreign as well as domestic sources. However, as the US current account of the balance of payments is necessarily equal to US capital inflows with the sign reversed, this means that if the US undertakes increased foreign borrowing its balance of payments deficit will increase – which goes in the direct opposite direction to Trump’s pledge to reduce the US trade deficit. If, however, the US does not engage in extra foreign borrowing then the reduction in US domestic saving which will result from the Trump tax cut would put downward pressure on US fixed investment – making it more difficult to achieve the US goal of increasing its medium/long term growth rate. Therefore, given the US tax cut, the US is faced either with the choice of increasing foreign borrowing, which would go against President Trump’s pledge to reduce the US trade deficit, or to reject increased foreign borrowing – in which case, because of the reduction in US domestic savings due to the tax cut, downward pressure on US fixed investment would be created. This would, in turn, put downward pressure on US economic growth. The consequences of this is that given the tax cut will be seen, after the normal cyclical recovery in 2018, not to achieve its goal of boosting US growth this is likely to lead to US neo-cons/economic nationalists falsely accusing other countries of creating the problems which have prevented US medium/long term growth accelerating. This may lead to such forces increasing their pressure for protectionist measures in the US. This article was previously published on Learning from China and originally published in Chinese at Sina Finance Opinion Leaders. 2018 represents 100 years of women’s suffrage, with 6th February marking the hundredth anniversary of the Representation of the Peoples Act. A rallying cry of the Suffragettes was Deeds Not Words. We have a government which pays lip service to women’s rights, their oppression and their representation. But these are only words. A century on we should analyse the actual real situation women face and our achievements. The struggle for equal pay for work of equal value is also a struggle against poverty. Those at the bottom of the pay scales at most workplaces are women. Even accounting for class and race differences women end up worse off - working class women are paid less than working class men; black women are paid less than black men; university educated women are paid less than university educated men and so on. The UK median gender pay gap is currently 18.4% for all employees and 9.1% for full-time workers. Despite the 1970 Equal Pay Act making the practice of paying men and women differently for the same work unlawful, the biggest single piece of legislation to narrow the gender pay gap was the introduction of the National Minimum Wage (NMW) in 1997. Women benefit disproportionately from minimum wage laws precisely because they are disproportionately low-paid. It also highlights the virtual absence of mechanisms to enforce equal pay. Recent efforts by the government to encourage employers to address their gender pay problems are making a stuttering start. Gender pay reporting legislation requires employers with 250 or more employees to publish statutory calculations every year showing how large the pay gap is between their male and female employees. The website has been open for submissions for almost a year and so far, only 6% of organisations have sent in their data. The data is now public. Organisations where the pay gap goes against women include Npower (19%), Cooperative Bank (30.3%), EasyJet (51.7%) and Phase Eight (64.8%). Easyjet’s accompanying report demonstrates a tone-deaf understanding of the situation. ‘Pilots are predominantly male and their higher salaries, relative to other employees, significantly increases the average male pay at easyJet’. Just 6% of its UK pilots — a role which pays £92,400 a year on average — are women, whereas 69% of lower-paid cabin crew are women, with an average annual salary of £24,800. There is no explanation of how EasyJet have attempted to challenge this state of affairs. Most of the big-name companies represented in the 500 reports insist that men and women are paid equally when in the same role and argue that it is an imbalance of women in lower-paying roles that skews the gender pay gap results. The Financial Times (FT) highlights companies that are producing statistical data that appear to be improbable, like companies with a 0% difference and companies that have altered their data more than once. Unnamed ‘pay consultants’ have suggested that in digging up the data, employers have discovered they might be inadvertently breaking the law. The FT appears to be preparing the ground for no action on gender pay because the statistics are too difficult to collect. A separate FT article in January noted that the ‘threats’ of sanctions and enforcements by the government are not enforceable, this time quoting employment specialist law firm Blake Morgan. There is currently a consultation out about what the sanctions should be, which was a criticism raised by trade unions before the scheme was introduced. It is true that there is no short-term fix, and an attempt to name and shame has many flaws, but it is becoming clear that excuses are being lined up and that this scheme will be ineffectual. The pay discrimination is so widespread and so extreme that naming and shaming cannot be a solution. There are simply too many companies practising huge pay discrimination. They can hide in the crowd. In the meantime, Carrie Gracie has highlighted yet again BBC gender pay inequality and a hot mike recording of John Humphreys and Jon Sopel complaining about her was leaked. An anonymous article by ‘BBC Women’ published on Comment is Free emphasises the fear that women feel speaking out and relates the lack of discussion to gaslighting, making women in the BBC feel that they are creating a problem not the other way around. The discussion between John and Jon and the reaction from the BBC seems to confirm that. Conditions at the BBC are simply the most public aspect of a near-universal problem. The growing #MeToo movement - started in Hollywood in response to some truly shocking revelations about sexual harassment, notably by Harvey Weinstein – is calling ‘Time’s Up’ on silence. The recently launched Time’s Up campaign, publicised largely by social media is currently a collection of 300 Hollywood women who have established a $13 million legal defence fund to provide support for women and men who’ve experienced sexual harassment or abuse in the workplace. This is a struggle against silencing women through non-disclosure agreements and the Time’s Up statement specifically acknowledges lower paid working women from other industries in their statement. This movement to call out injustice faced by women is spreading and the collective approach is welcome. Because women really are on the frontline of poverty and the government policy of austerity. Not only do women receive lower wages, they also disproportionately work in the parts of the economy that is being cut hardest, the public sector pay freezes and cuts have seen women disproportionately lost their jobs or forced go part time since 2010. That impact is still being felt a decade on from the Great Recession. In addition, because public sector services are being closed down or reduced, the burden to perform these tasks – childcare, caring for elderly or disabled relatives has fallen to women as the traditional care givers, but also because they are being shut out of work, under paid and under employed. This triple-whammy effect is what is meant by the statistic that 86% of the cuts have fallen on the shoulders of women. Some of the more excruciating examples of the cuts to social care come from women subjected to domestic violence who are falling through the cracks. Two women a week in England and Wales are killed by their partners/ex-partners. Yet across the country women’s refuge budgets have been slashed by nearly a quarter over the past seven years. Three quarters councils in England have reduced the amount spent on refuges since 2010. The system is at breaking point. Worse – refuges who have won bids are reporting that they have not received the funds 8 months later, forcing one shelter to put its entire staff on notice out of fear of imminent closure. There are so many shocking highlights of how these cuts have hollowed out services - a month after Grenfell a ceiling of a refuge in the same borough collapsed and in a report by Women’s Aid, they announced that 78 women and 78 children were turned away from refuges in a single day in 2016. The Tories announced £100million funding for services until 2020, with half allocated to local authorities in the form of ring-fenced grants. But this doesn’t have to be spent just on refuges - also homeless people, drug addicts or older people. This is miserably low amount given the scale of the problems. Little known public proposals by the government plan to remove refuges and other short term supported housing from the welfare system, which could leave vulnerable women fleeing abusive partners unable to pay for their accommodation using housing benefit, the last guaranteed source of income available to refuges. On average, housing benefit makes up 53% of refuge funding. In order to analyse how far women have come in a hundred years, we can’t look at the successful outliers who have done well, we should look at those who are at the very bottom and evaluate how far the positive changes made by women have affected all women. The challenges that were faced by the Suffragettes in the early twentieth century for equal pay, better working conditions, housing, health and control over their bodies are still largely our unfinished business. Even if the media are not watching and it is difficult to simply be believed, it is important to remember that women’s lives are deeply affected by the impact of austerity and should be central to challenging it, because the silent majority is building and those standing in our way will be on the wrong side of history.